For those of you in the United States, the words "green milkshake" might conjure thoughts of the seasonal shamrock-variety. Other than the hue, this recipe has little in common with the fast-food version. Sunshine, bike rides, and outdoor runs have me craving refreshing foods. 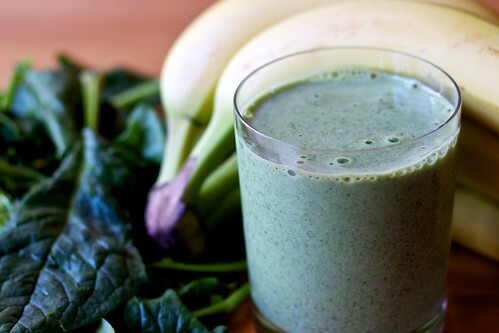 This green milkshake is a wonderful way to start the day full of energy. I grew up with blenders that couldn't chop ice any better than a hand mixer, and perhaps as a result I have long coveted fancy blenders like Vitamix. But, working within my grad student budget, I recently began to look into lower-end models. I decided to try my luck with a $15 model from Hamilton Beach and I couldn't be happier. Now I just hope the motor lasts more than a season. Add the ingredients in the order they appear above. Blend until smooth. Serve immediately. I like to use organic products for this recipe, but I generally don't go out of my way to buy organic bananas. *These ingredients are optional. For flaxseed oil, I use Barlean's. For wheat grass powder, I use Amazing Grass. These items are a pricey initial investment, but they will last you quite a while. I too have jumped on the green shake/smoothie bandwagon, and I'm loving it. Kale every day! Hooray! Shannalee, I haven't moved up to kale yet. I'll give it a try next week! That is good news Hannah - thank you! I can stand a bit of a smokey smell if the blender lasts more than a few months. i make something similar to this- but i add a 1/4 cup pineapple and 1/2 cup mango for a tropical twist! i use peach juice instead of milk (also good for those non-dairy folks out there).. and freeze the fruit so i dont need to add ice. turns out the most lovely color. yummy yummy green shakes!! thanks for this recipe! Yum yum. I've been adding pureed pumpkin to my green smoothies lately. SO GOOD. P.s your carrot and white bean post from January looks heavenly! Do the chia seeds, flax seed oil and wheat grass powder add flavor, or are they included only/primarily for the health benefits? I like your twist on it Mandapants! Thank you Kelsey! I am looking forward to trying out your pumpkin puree suggestion. Hi Anita, the flaxseed and wheat grass are primarily for the health benefits. The chia seeds, while beneficial, also add a great texture to the shake. If you haven't used chia seeds before, I'd compare them to tiny tapioca balls. They suspend in the shake and add something that I enjoy. Great question! Thanks for this great recipe. I've been trying out green drinks lately and can't wait to try this one! Thanks Suzanne, I hope you like it. I've had one nearly every morning since I posted this recipe. I highly recommend starting your day with one! 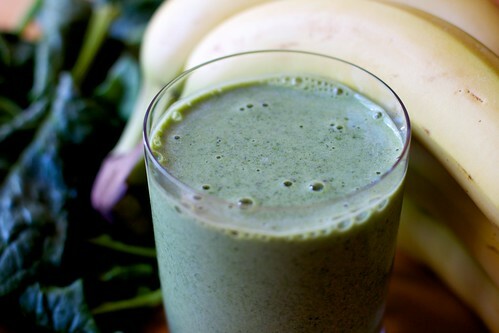 Would try this green milkshake. Thanks a lot!